The head of the Argentine navy has been sacked following the loss of a submarine and its crew in the South Atlantic last month. The defence minister placed Adm Marcelo Srur in retirement on Friday night, it has emerged. The ARA San Juan disappeared with 44 crew on board after reporting an electrical problem off the coast of Patagonia. An international search operation has failed to locate the vessel. The families of the missing have urged the government to keep looking for the submarine, describing the anguish of living with uncertainty since the rescue operation was wound up just over two weeks ago. Some ships are still searching in an area where a loud noise was recorded in the hours following the disappearance – possible evidence that the submarine imploded. 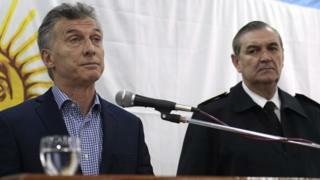 President Mauricio Macri has created a special independent commission to investigate the disappearance of the submarine, following criticism about the handling of the operation. The commission will comprise three submariners – one the father of one of the disappeared crew. Defence Minister Oscar Aguad has promised the investigation will be “transparent” and will have an unlimited budget. “We ask that they always tell us the truth, that they keep us informed about what’s happening,” said Jorge Villareal, father of missing crew member Fernando, according to Efe news agency. Adm Srur, 60, was appointed by President Macri in January 2016.
Who are the crew of missing Argentine submarine?